Medicine: Cancer; Diuretic; Homeopathy; Hypoglycaemic; Hypotensive; Miscellany; Narcotic. The green pods are mildly diuretic and contain a substance that reduces the blood sugar level. The seed is diuretic, hypoglycaemic and hypotensive. Ground into flour, it is used externally in the treatment of ulcers. The seed is also used in the treatment of cancer of the blood. When bruised and boiled with garlic they have cured intractable coughs. The root is dangerously narcotic. A homeopathic remedy is made from the entire fresh herb. It is used in the treatment of rheumatism and arthritis, plus disorders of the urinary tract. 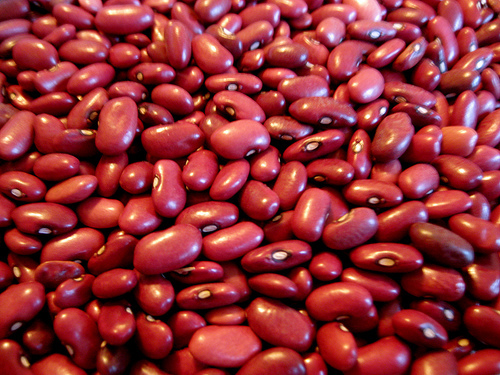 A brown dye is obtained from red kidney beans. The plant contains phaseolin, which has fungicidal activity. Water from the cooked beans is very effective in reviving woollen fabrics. Known Hazards: Large quantities of the raw mature seed are poisonous. Children eating just a few seeds have shown mild forms of poisoning with nausea and diarrhea, though complete recovery took place in 12 - 24 hours.